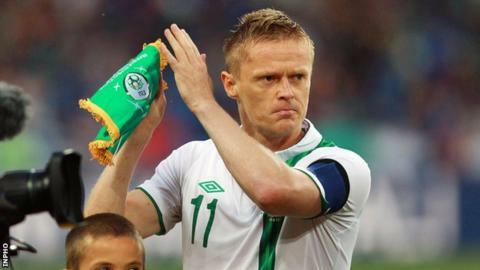 Republic of Ireland assistant manager Marco Tardelli continues to hold out hope that Damien Duff might be persuaded to reverse his decision to retire from international duty. Duff made clear in weekend interviews that he would not be changing his mind but Tardelli claimed on Monday that the Fulham player's return was "possible". "He said he has stopped but I hope he will come back," said Tardelli. The Republic face Kazakhstan in their opening World Cup qualifier on Friday. Tardelli hopes the winger could be persuaded to come back for the country's second qualifier against Germany in October. "I know he has said he has retired but I hope he will be back for the Germany game. It is possible," Tardelli said. "I don't know if he will or not, but I always see him during Fulham's matches and I think it is possible, why not?" However, Duff said over the weekend that players who retire "should stand by their decision". "When people retire I think it's good that you stay there," the 33-year-old told the Sunday Independent. "You see people coming out and back in." Manager Giovanni Trapattoni has to contend with Shay Given's retirement following the disappointing Euro 2012 finals while Darron Gibson pulled out of the squad for the Kazakhstan game. The Everton midfielder has told manager Giovanni Trapattoni that he is still suffering the disappointment of playing a limited role at the Euro 2012 finals.